What are the four different layers of the earth? Geologists have observed vibrations (seismic waves) made by earthquakes to understand the structure of the earth’s inside. 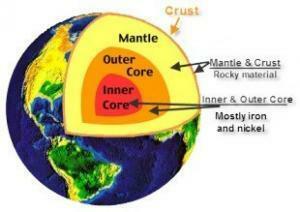 They found that it is divided into these distinct layers: the crust, the mantle , outer Core and the inner core. Crust is the top or the outermost layer. It is very solid, and also the thinnest of all layers, only about 5000m thick under the oceans and about 30000m of thickness under the landmasses. It is made of two parts, upper and lower, the thick upper layer is made of extremely hot, semisolid liquid rock pattern and is located directly below the crust and is about 2,900 km thick. 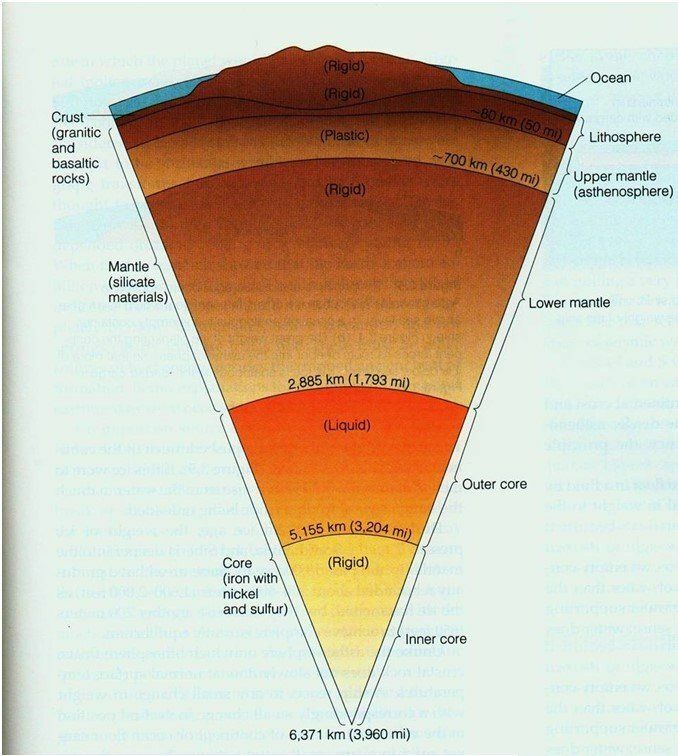 The outer core is the only layer which is a liquid layer: an ocean of mostly thoroughly liquid iron and nickel. It is about 1,800 to 3,000 miles below the surface and about 2,300 km thick. An extremely hot layer, solid ball of iron and nickel at the center of the earth. It is 3,000 to 3,960 miles below the surface and about 1,200 km in diameter. This layer is made up of the crust and a very small lining of the upper mantle; it is divided into many slowly moving plates of solid structure that has the continents and oceans above it. The upper mantle makes the plates of the lithosphere move on this hot, liquid magma right below the lithosphere. How deep are the layer of the earth? German scientist Alfred Wegener was the first who found that the coastal length of Africa and South America seemed like a jigsaw puzzle that fit together. He also got proof of the same by studying and analyzing the plant and animal fossils along the coasts of these continents, even though now they were separated by vast oceans. He also noticed that physical formations, like mountain ranges, on the two continents also were same. Later in the book, The Origin of Continents and Oceans, he described that the earth’s continents were once one large mass and called it the supercontinent Pangaea, meaning “all the earth”. Pangaea is believed to have split into different landmasses and continental pieces in geological time and now moved to its current locations on the planet. Pangaea breaks up into two major land masses. Laurasia in the north made up of North America and Eurasia andGondwana in the south. Laurasia separates from Eurasia and North America and then Africa is separated from South America and Madagascar as South America drifts away. Now Greenland moves away from North America and Australia floats northwards separating from Antarctica. The modern plate tectonics theory, says that the earth’s outer layer, or lithosphere, is broken into several large pieces called plates. These are tectonic plates, which hold the continents and oceans and are slowly but constantly moving on the Earth’s surface. The movement of the plates proves that the continents are not fixed and had moved over time, and also describes how and why earthquakes, volcanoes, and other events occur in Nature. Crust: Crust is the top or the outermost layer. It is very solid, and also the thinnest of all layers, only about 5000m thick under the oceans and about 30000m of thickness under the landmasses. Mantle: It is made of two parts, upper and lower, the thick layer is made of extremely hot, semisolid rock is located directly below the crust and is about 1,800 miles (2,900 km) thick. Outer core: The outer core is the only layer which is a liquid layer: an ocean of mostly thoroughly liquid iron and nickel. It is about 1,800 to 3,000 miles below the surface and about 2,300 km thick. Lithosphere: This layer is made up of the crust and a very small lining of the upper mantle; it is split into many slowly moving plates of solid structure that consists of the continents and oceans.